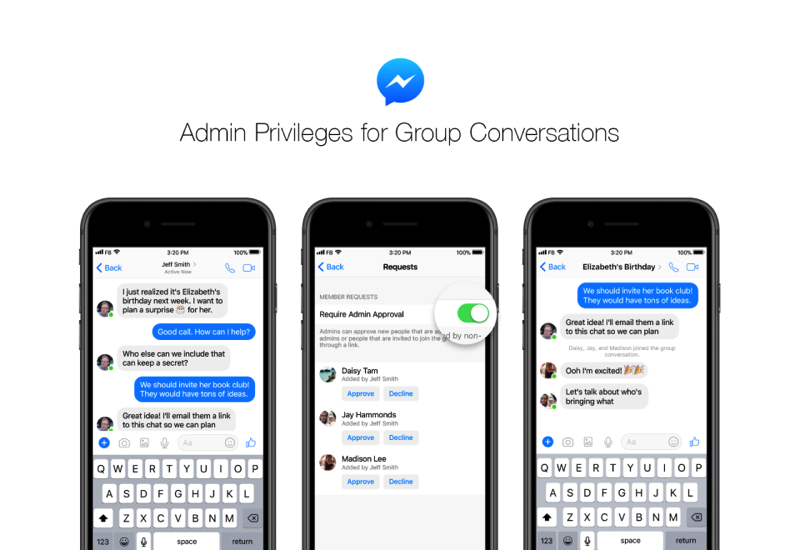 If you’re part of a large group chat on Facebook Messenger, new features have arrived to better control conversations and who can participate. A new admin privileges feature will let groups approve new members before they join, while also promote or demote others into admin roles. This aims to provide better controls so outsiders aren’t invited by others at random. Another feature is the addition of joinable links, which lets users within a group chat easily invite others to the conversation with one-tap. If approvals are off, anyone who clicks the link can join the chat, or await approval if approvals are toggled on. Facebook says Messenger group chats allow up to 250 people at one time, and last year saw 2.5 million new groups created every day on the platform. The new features for Messenger come as Facebook is under intense scrutiny for the way it has handled information, amid the Cambridge Analytica data scandal. Earlier today, Facebook CEO Mark Zuckerberg admitted the company made mistakes and is committed to fixing abuse on the social network’s platform. Canada’s Privacy Commissioner also stated they are investigating Facebook and how it handled user data, linked to Cambridge Analytica.